It is a solution for your peripheral units such as distributors, construction site managers or department employees to deliver their purchase requests to the related purchasing officers, where these requests are then put into operation. Descriptions, notes or related documents can be attached to these requests. Delivering the changes in the procurement process to the peripherals is critical to the coordination between the teams. Communication failures may lead to incorrect purchases and reduce the efficiency of teams by causing excessive telephone and email traffic. JETRACT offers accessibility from anywhere and anytime with its mobile interface compatibility. Changes in the procurement process are delivered to the peripherals with immediate notifications. 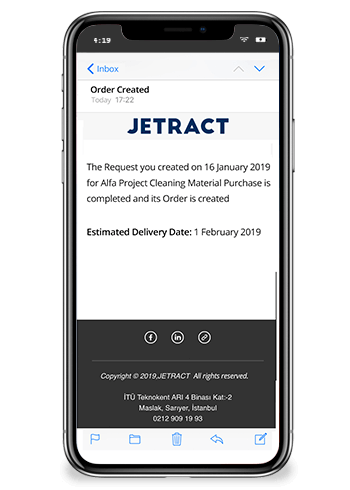 Achieve higher savings, efficiency, transparency and reportability in your company’s procurement by using JETRACT services. Does not require credit card or any commitment. © JETRACT 2019, All rights reserved. By registering you accept and agree to our User Agreement.